Ok so I am a less than accomplished artist, even going so far as saying that I am in fact a complete novice and I cannot actually draw to save my life. I have been practicing for a while now, learning to draw several parts of the human body, but in particular faces as they tend to be one of the hardest parts of a person to draw. Here are my practice results as the weeks have gone on. I tried several different faces, but in one way or another they all look the same. I aren’t particularly happy with these sketches but then they weren’t meant to be anything special, just some practices so that I could learn to get the basic shape of the head right along with the startings of understanding the structure of the face a little better. Something I did find especially hard to get right was the hair on the characters, the female in the picture on the right in the top corner is the only one that I am actually happy with as the hair doesn’t look too bad. All the others annoy me because they don’t seem to have that much about them in terms of look or personality. I might expand on the character of the female and bring her into being a character with her own concept sheet and back story. But that is still something that needs to be considered. 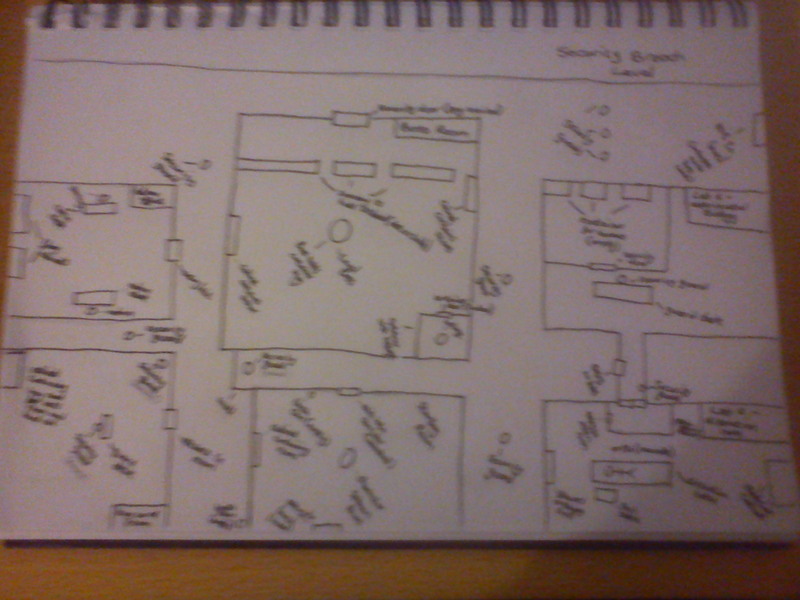 So this is a rough drawing of my level design map, created in Google Sketch Up. 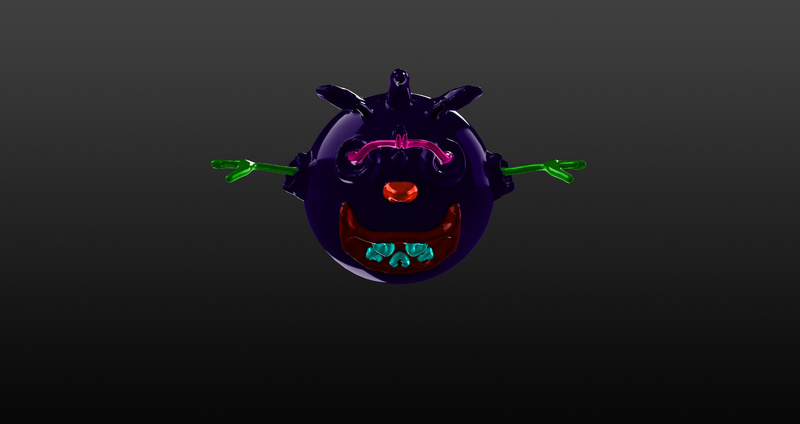 The final model will be created within either UDK or 3Ds Max. The level map is currently untextured, the textures and security doors and all of the small final details will be added to the final model. 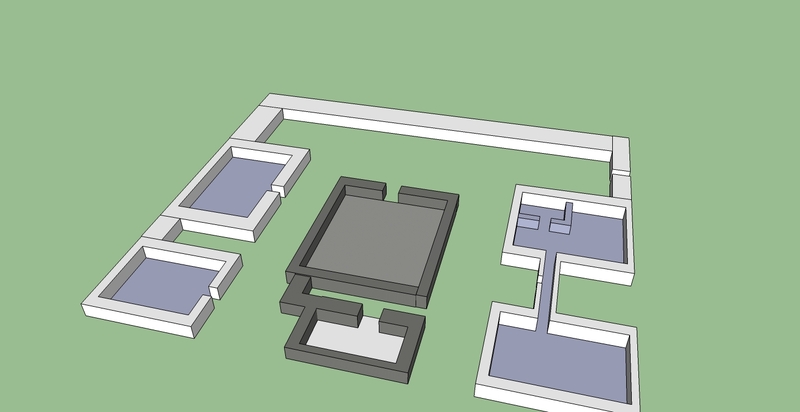 This is just a rough draft of the 3D level to see what it would look like, small changes will have to be made to it to make it a good looking level with some challenges for the player, such as a replenishment of security guards every time the player enters a room to search it and security cameras in the hallways that the player can destroy so that the guards aren’t alerted to the players presence within the facility. There will likely be more rooms added as well along with multiple floors for the player to explore and additional items for the player to collect before they can enter the boss room. 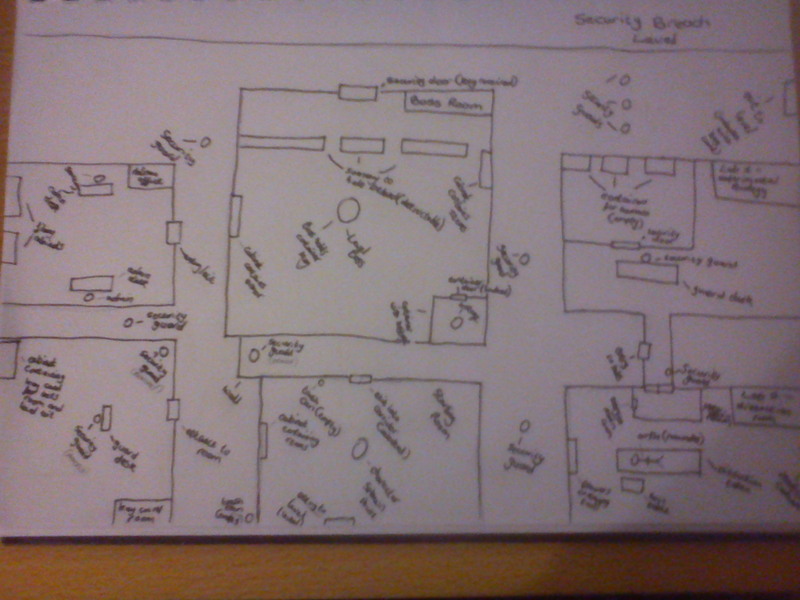 This is the drawn draft of my model for a security breach level, the player starts in the bottom center room and has to work their way around the level, taking out guards in any way they like, to the bottom left room of the map to retrieve the security code key for the room where their friend is held hostage by a group that wants to experiment on them because of their magical powers. All of the rooms are explorable and items can be found in the cabinets and storage areas. Once the key has been acquired the player needs to travel back to the locked security door and fight the boss of the facility. Once he has been defeated, the player can free their friend and flee from the facility, choosing to set off times explosives if they wish to flatten the facility at the end of the level. There will be a 3D model of this map as well, then there will eventually be a finished version of this level with fully finished textures and lighting. So this is the first level I have designed for my game idea. It is a security breach type level with the player leading the character through many rooms, taking out guards and finding items and key cards in order to progress to the final boss battle and the freeing of their team mate from the container in the back of the boss room. This is just a rough drawing, there is a model in the works at the moment and should be uploaded within the next couple of days. The player starts in the middle bottom room, the entrance that they enter through locks so that they cannot leave the level without completing it. 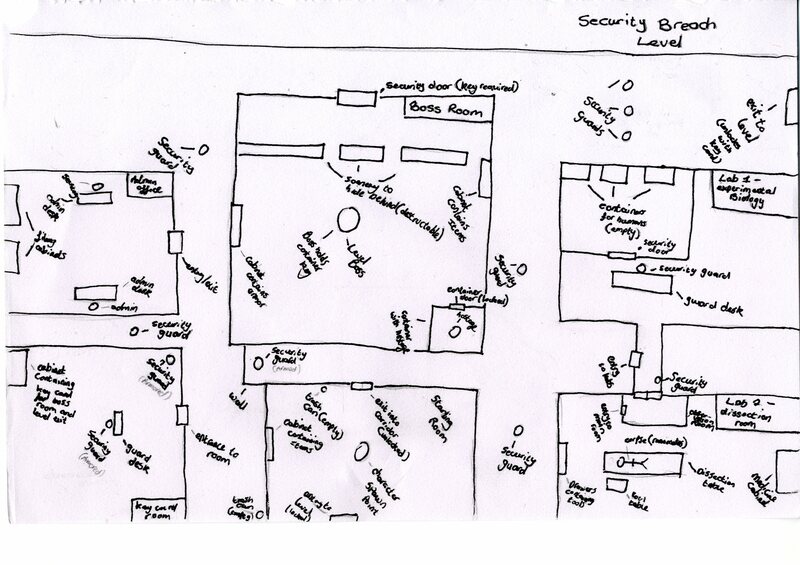 They have to work their way around the map, taking out guards in any way they wish while they progress through the level, there may be other humans within the containers in the experimental biology lab in the top right of the map that the player can choose to free or leave there as they can choose to go into any and all rooms that they wish to investigate. They eventually need to make their way around the map to the key card room which is guarded by several heavily armoured and armed guards, once they have acquired the key card they will have to progress back to the boss room where they can open the door and step in, taking cover as they come under fire from the super powered boss in the room. Once they have overpowered this supernatural brute, they can free their friend and then break out of the facility to safety. So I have recently been using the program called Sculptris, it is something that I have never used before so I thought I would give it a try at the suggestion of a friend and I must say it is one of the better programs I have used for creation in a while. Sure I have limited experience with most programs anyway this was actually pretty easy to figure out and use. Below is a picture of my first creation, I aren’t really sure what it is meant to be as I was just trying the program out and this just sort of came into being. I will definitely use this program again to come up with some proper character renders whilst I am learning to use this and other programs. I did however encounter some difficulty with the program when it came to saving the final render as an image instead of a normal file for the program to open up with the next time I clicked on it, after some searching I did find the solution to my problem and obviously was able to save this quick and simple render as an image so that I could show it off on here. In the mean time say hello to Norman the random purple creature. He may be reshaped and could even be a character in one of my several game ideas. Maybe. We shall see how things go first really as there is a lot floating in the air at the moment. The game is set in a side view fighting game. The player will choose a character from a list at the beginning of each match, once they have chosen their character they will then choose their setting and they will battle against either a computer opponent or one of their friends if they are playing multiplayer. The challenges presented for the player are simple, they just have to play against opponents and defeat them. If the player is playing in the campaign mode then they have the chance to unlock new characters, other than that the game is pretty simplistic in its challenges and approach, with the character only needing to defeat their opponents. The player uses a combination of fighting moves to overcome their opponents. The overall achievement of the game is to unlock all characters and complete all set challenges and achievements. With the game being simplistic in terms of gameplay, there will need to be some kind of challenge list and achievement list along with the rewards that the player is awarded whenever they complete a challenge or achievement. If the game is for Xbox then the player could complete a set list of achievements in order to collect Gamerscore and if the game is on PS3 then the player can complete achievements in order to collect trophies. Of course there will be achievements that can only be completed by the player when they play the higher difficulties so there is a certain amount of replayability within the game. The challenge list could be a set of fights that the player has to complete, along with survival challenges where the player has to last as long as possible against a continuous stream of opponents, the longer they last, the more they can unlock in terms of content, bonus’s for outside the game and possibly unlockable characters. 3. The role of the player. The player is the controller of the character. They are pretending to be a fighter within a match up against another fighter. The player helps to define the gameplay with their skill at side view fighting games, if they are new to the game and don’t know the controls very well or they are still getting used to timing their moves, then the gameplay will be a little bit different and they will struggle with higher level opponents while players that have spent lots of time playing this type of game will know the controls and will have a certain level of skill meaning they will find the game relatively easy to play and they will play through it in a relatively shorter time frame as opposed to the newer player. The game is set against a variety of backgrounds ranging from countryside settings to castle grounds, as the game is a side view fighting game, there won’t be a need for dynamic 3D fighting scenes. The ground will reflect the background scene on the screen. There will be a mixture of settings, ranging from an open field to a castle courtyard and even scenes near mountains and oceans. The player will interact with the game through the use of an avatar that is based upon pre-existing characters, through this avatar the player will be able to interact with the other characters within the game. The game will be viewed from a side on perspective, so the player will be looking into the game as if they are at the side of the arena, so they will see everything on screen. Story Mode – Each character will have a story to tell, this will be told through cut scenes and then battles with various foes, each character will have a different story and will encounter different opponents, with some crossover as there will be limited characters. After several character stories are completed, new characters can be unlocked and bonus content can be awarded. Multiplayer – This will be the option for players that want to either go into multiplayer games with their friends or they can go online and fight against other players in online game modes. Survival Mode – This is a continuous game mode, with the player choosing one character to play with against opponents in a constant stream until the player character loses their entire life bar. The longer the player can last, the better their record and the more likely they are of being rewarded with new characters or bonus content. Options – This option gives the player the chance to change their controller, audio, graphics and gameplay options. Bonus Content – Unlocked bonus content can be viewed in this gallery. The game is intended to be competitive to a degree as there will be leader boards for people to view during online play, so that they can compare their victories with their friends. There are single player and multiplayer components to the game, single player being the story mode and the multiplayer being the split screen option and the online multiplayer option. The players can either use the same machine, through the split screen option or they can play on separate machines at home through the online play option. The online play will obviously require an internet connection. Each character has their own backstory that the player can explore in the single player story mode, but there isn’t a set plot for the game, it is more gameplay driven than plot driven. The game falls into the fighting game genre. The target audience are mainly individuals of ages 12+ as the game will be quite violent and children under a certain age will not be allowed to play this kind of game. Players who are interested in something that is a welcome break from a story driven game will be interested in this kind of game as there is very little plot and is more gameplay driven, with the player choosing a character and jumping straight into a fight than having to go off and find an item in a dangerous area. This game will be designed for the Xbox 360 and PS3 mainly as there will be the need for a controller, there may be a PC version released if there is a high demand for it but this is very unlikely. So the other day I bought a brand new book titled Dragon Art. I had set out to buy a new book that offered drawing tips and practices so that I could improve upon my feeble drawing skills, but instead I got this one because it had cool illustrations and background about various dragon art artists along with some ways in which to go about drawing dragons myself. Flicking through this book has unwittingly led to me having a new idea for a potential game. A couple of potential titles for it could either be Dragon Master or Heart of the Dragon. The main point of the game is the character and their struggle. In the game the character is a hired hand, paid by the rich and powerful to slay a dragon that has been plaguing their city for many years. This currently unnamed hired hand accepts the job and sets off to hunt down the dragon on the outskirts of the city. After many hours of searching and finding clues as to the whereabouts of this fabled nightmare, the hired hand finds the cavern that the dragon has made its home in. Sneaking into the cavern as quietly as can be done while wearing plate armor and chain mail, the hired hand manages to sneak up to the dragon and is about to plunge his sword into the back of the head of the beast when its tail whips around and swats him against a wall. The dragon having heard him coming feigned to be asleep while the hired hand sneaked into the cavern so that it could dispatch him quickly. A fierce battle ensues with the hired hand barely able to dodge many of the dragons ferocious attacks, while the dragon becomes increasingly annoyed because it cannot just swat this pain away. After acquiring many wounds, the hired hand manages to slay the dragon by throwing his sword blindly and piercing the beasts throat, causing blood to spray everywhere. Because the hired hand can shield himself from the river of blood, he is covered in it and some of the blood seeps into his wounds, fusing with his own blood and altering his DNA. Now with minimal thought, this hired hand can now take on the form of a dragon, granting him all of the strengths and powers of the fabled beasts. He is the first of his kind, as when he transforms into a dragon, he retains his own mind and can control himself. However, the longer he is in the form, the more dangerous it becomes as each transformation shall increase the rate in which the dragon blood will convert his human blood and his mind comes closer and closer to that of an actual dragons. If left in dragon form for too long, he will lose all of his humanity and become the very thing he was hired to kill in the first place. This is just a rough idea at the moment, but one that I feel that needs to be followed up on as it is something different from current releases on the game market. While there are plenty of games involving dragons, Skyrim being the most recent, there is very little in the way of a hybrid of human and dragon, with the main character having the ability to become one of the creatures of myth and nightmare. I will look into it some more and come up with some more ideas for it along with a level for the city that he is hired by along with a possible rough draft of the dragon, but this may take some time to do while I am working on other projects. This is definitely something I want to do though and will likely be taken up as a hobby project, being worked on slowly so that it can be designed and developed properly.